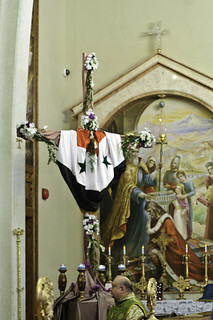 Syria's commercial center and largest city, Aleppo, was divided at the start of the Syrian conflict in July 2012. The government lost control of half of the metropolitan area, key towns surrounding the city, and the international airport. The situation has changed substantially since October 2013. The Syrian army captured key towns in the countryside surrounding Aleppo, a critical army base, the international airport, and scores of smaller villages. Government forces continue to take key locations in preparation for a final push to retake the city. The tactics on both sides are brutal. Syrian forces drop barrel bombs on Aleppo's rebel strongholds. Rebels recently executed twenty-one Syrian government sympathizers. Yabrud is a small town in the mountainous region known as Qalamoun. It borders Lebanon. Control of this area can facilitate or stop the flow of arms to Syrian rebels. The city is controlled by a local group of the now weakened Free Syrian Army. By reports, the majority Sunni Moslems and minority Christians have worked together to survive the ravages of the conflict common throughout the troubled nation. The city also serves as a home to a substantial number of "rebel gunmen." As the Syrian army advances, the rebels fight with each other. The Al Qaeda affiliated Islamic State of Iraq and the Levant (ISIS) routinely attacks other rebel forces and both ISIS and the Saudi sponsored Islamic Front attack the remnants of the Free Syrian Army (FSA) at will. Is a victory by the Syrian government probable or even inevitable? This question was unthinkable at the onset of hostilities between the Syrian government and rebel forces aided by outside funding and fighters? Taking back all or a substantial part of the rebel held area in Aleppo would place Syria's two largest urban areas under government control (Damascus is the second largest city). Controlling Yabrud would cut off supplies to rebel forces from one of the most productive routes. Both areas are key to the control of northern Syria. The remaining source of rebel weapons for the north, the Turkish government of embattled Prime Minister Recep Erdogan, is drying up as greater scrutiny is placed on the prime minister's aid to Islamist jihadist rebel groups. Reports indicate that a government victory in Yabrud may spark a renewed offensive in the southern region of Syria near the city of Daraa, a hotbed of revolutionary activity near the border with Jordan. United States troops are stationed near the border giving the Obama administration one last opportunity for a Gulf of Tonkin variation to justify U.S. military intervention. While a possibility, the lucrative rewards of a rapprochement with Iran, Syria's steadfast ally, are too great to justify anything close to a commitment of ground forces or ongoing aerial attacks on Syria. That was tried and failed miserably. Far from the cries of "Assad must go" heard from former Secretary of State Hillary Clinton, the realpolitik of today's situation in Syria is grim for the United States, Turkey, the Gulf oil states, and other NATO supporters of regime change. The sovereign state of Syria may remain that way. The costs to the Syrian people are enormous. Millions have fled, the nation is largely gutted due to the choice by rebels to focus their fight in urban areas, and over 100,000 died in the conflict to date. The only outright winners in the tragic conflict are Syria's allies, Iran and the Soviet Union. Iran's billions of dollars in aid to the government and Russia's diplomatic skills and weapons supply have allowed the Syrian government to fight the combined resources and personnel of the major NATO players (with the exception of Germany), Saudi Arabia, Qatar, plus jihadist volunteers from Moslem countries from Libya to Indonesia.